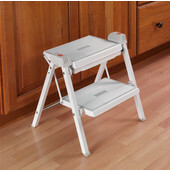 "Built-In Step Stool" for under or in a cabinet. Double Step Stool with a Walnut Finish. Get to those hard to reach areas of your home with light and sturdy step ladders and step stools from Hafele and Winsome Wood. 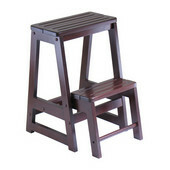 Simplify your tasks by choosing from our large collection of step stools and ladders that feature pioneering and innovative designs that are simple. Some even double as decorative accessories for your home. Select from the natural beauty of natural wood, or lightweight plastic or aluminum. Many of our step stools fold up and tuck away conveniently in very small spaces, allowing extra storage space for other items. These rugged designs are sure to last.